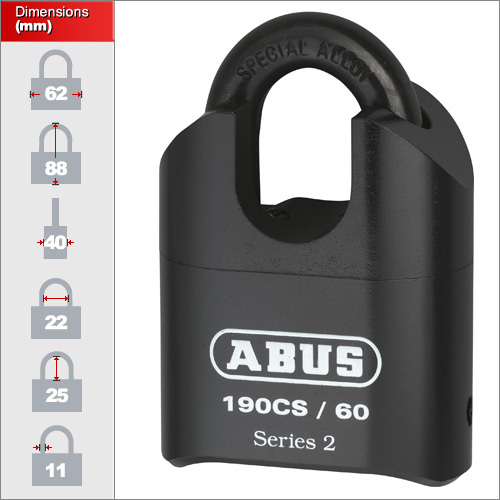 Our most secure combination padlock is the updated and improved closed shackle combination padlock ABUS 190 Series. A high strength steel body protects this model where smaller types will fail against force attacks. They have also improved the weatherproofing of this lock in the series two model by using a special chrome plate. Each padlock has a 4 digit pin number located on the bottom of the lock resettable to you choice of code using a special security key preventing anyone from changing the combination at a later stage. 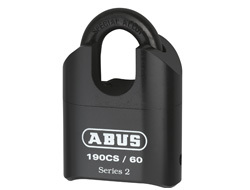 Note that maximum chain thickness that will fit this padlock is 12mm. A tangible ratchet combination mechanism makes setting the numbers easy even for hard of sight individuals. The casing is solid steel with a substantial 11mm shackle.